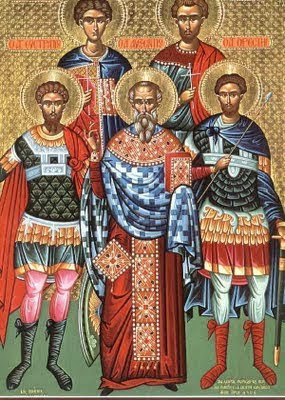 On the thirteenth of this month [December], we commemorate the Holy Martyrs Eustratios, Auxentios, Eugenios, Mardarios and Orestes. Were killed once by the two means of fire and sword. On the thirteenth Eustratios and those with him were slain by the sword. 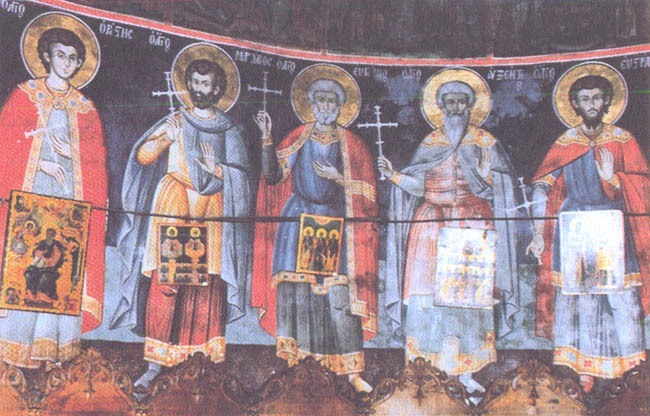 These Saints lived during the years of Diocletian and Maximianus (284-305) the impious emperors, when the duke Lysias was governor of the province of Limitanea and Agrikolaos administered all the provinces of the East. These five Martyrs revered Christ from the time of their ancestors, but hid the fact that they were Christians, out fear of these tyrants and persecutors. Of these, Saint Eustratios* came from the city of Aravraka, and held the position of secretary and the office of military commander. He had the desire to boldly express his faith in Christ, but feared the outcome of this action. For this reason he gave his officer belt to a servant and commanded him to go to the church of the city of Aravraka and leave it there. The Saint took this action having in mind the following: if his belt, which was left at the entrance of the Holy Sanctuary, was found and taken by the priest Auxentios, it would have been a divine indication that he could step forth and reveal his faith and suffer a martyr's death for which he desired. But if the belt was found and taken by someone else, it meant that he would keep his faith in secret because it was not time yet to express it. The servant complied with the mandate of the Saint, and upon returning, informed him that his belt was found and taken by the priest Auxentius. Thus the Saint took the view that his testimony for the sake of Christ will have a good outcome. Indeed, he then presented himself to Lysias and told him with frankness that he believed in Christ. In addition, the Saint came forth before Lysias as the leader among other saints who came from the military class, and was the first to declare himself a Christian and harshly scrutinized Lysias. After this, Lysias, became furious and immediately deposed him from his office. Then, he commanded the executioners to make him go through a terrible torture. First they removed his clothes and left him naked, and after stretching his body on the ground with a special machine, they started beating him mercilessly with whips. Then, he was tied with a rope and lifted up. They lit a big fire under his body and burnt him. They then mixed salt and vinegar and poured the mixture over his burned body parts. After all these, they destroyed his sides with stones. The Saint and Martyr, however, after the miraculous intervention of God, was perfectly healthy. This led Saint Eugenios to join the faith of Christ. 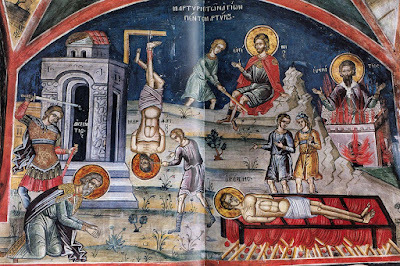 Then the executioners put iron shoes on the feet of Saint Eustratios which had spikes inside them, and led him to Sebaste of Nicopolis in Armenia along with Eugenios. On the way to Nicopolis, Saint Mardarios saw him driven this way and started blessing him much for his endurance and patience. Then, he consulted his wife, who encouraged him to also become a martyr for the love of Christ. Therefore Mardarios came running to Saint Eustratios who was walking, tied himself on the shackles, and told the soldiers that he was a Christian. 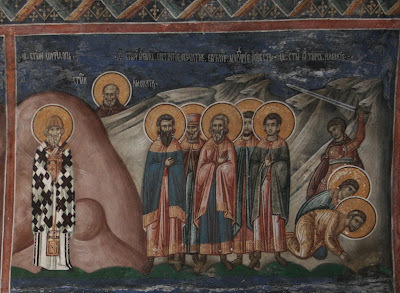 As soon as Lysias sat in his judging room, he commanded his soldiers to bring Saint Auxentios before him. There, the tyrant attempted to persuade him to return to paganism, but the Saint refused categorically by stating that he remains steadfast in the faith of Christ. Lysias then became incensed and commanded his executioners and they beheaded Auxentios. Then Saint Mardarios was led to trial. But despite the efforts of the tyrant to dissuade him, he stayed committed to Christ. Lysias resented this fact and made the Saint go through torture. Therefore, they first pierced his ankles with an iron, and after passing through the holes ropes, they hung him facing down. Then, they burnt his kidneys and back with hot rods. So, in this way, Saint Mardarios became a Martyr and delivered his spirit to the Lord. Then the judges led Saint Eugenios in. But he also remained steadfast in his faith in Christ. That is why the executioners cut off his tongue from the root and crushed his legs with clubs. From this suffering the Martyr Eugenios surrendered his soul into the hands of the Lord. After this, Lysias went to the exercise field in order to exercise his soldiers. Among them, there was a soldier named Orestes. This soldier was a Christian, but until that time, he hid his faith. At some point during his throwing of the javelin, the Cross that he was wearing came out of his clothes and appeared in the open. So after this incident, he had to confess his faith. Lysias was left dumbfounded by this revelation and with his dictates, the other soldiers tied Orestes with iron chains together with Saint Eustratios. But he did not keep them in Nicopolis to judge them himself, but sent them to Sebaste to be judged by Agrikolaos. Lysias perhaps feared that by miracles the Saint would attract many others to the faith of Christ. 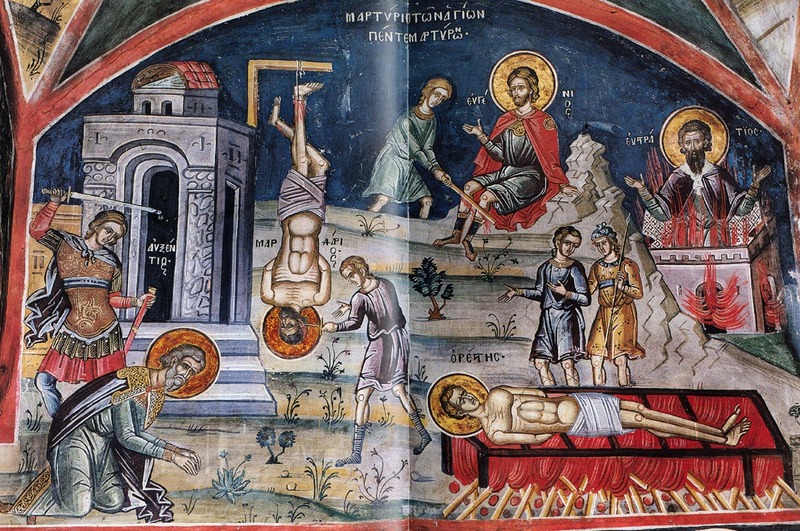 Before Agrikolaos, Saint Eustratios who was very well educated and had excellent theological and philosophical training, analyzed throughout Christ's teachings for the salvation of man. With his words, the Saint caused astonishment but also an unspeakable anger in the tyrant. After this, the Saint was imprisoned. There, in prison during the night, he was visited by the Bishop of Sebaste, Saint Blaise (Feb. 11), and was given Communion. Then Saint Eustratios give him the text of his will and asked him for its faithful execution. After some time the tyrant commanded his executioners and they first laid Saint Orestes over a fiery gridiron. There the Saint completed his life and delivered his spirit to the Lord. Then the executioners lit a furnace and threw Saint Eustratios inside it. 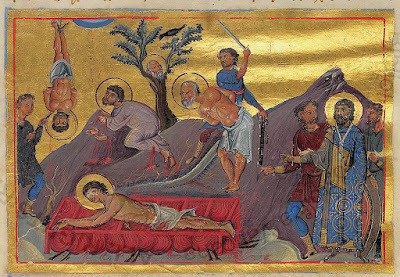 This is how his life ended and how the five holy Martyrs received from the Lord the crown of martyrdom. * In the Synaxarion Eustratios is given the Latin title of scriniarius, that is, "keeper of the archives." 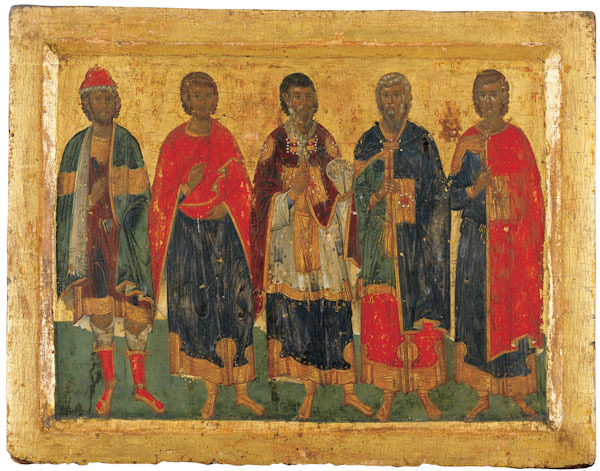 ** Their relics were later taken to Constantinople, and were preserved in the church dedicated to them - The Holy Five Companions. They were seen alive in that church. God and Master, Father Almighty; Lord, Only Begotten Son, Jesus Christ and Holy Spirit, one godhead, one power, have mercy on me a sinner; and by the judgements which you know, save me your unworthy servant; for you are blessed to the ages of ages. Amen. I magnify You greatly, O Lord, because you have looked upon my lowliness, and have not handed me into the hands of enemies, but have saved my soul from constraints. And now, Master, let Your hand protect me, and Your mercy come upon me, for my soul has been troubled and is greatly afflicted at its departure from this wretched and soiled body of mine. May the evil plan of the adversary never confront and obstruct it, because of the many sins committed by me in this life in knowledge and in ignorance. Be merciful to me, Master, and never let my soul see the dark and gloomy sight of the evil demons; but may your bright and shining Angels receive it, giving glory to your holy Name, and bring me by Your power to your divine judgement seat. When I am judged, let not the hand of the ruler of this world seize me to cast me, sinner that I am, into the depths of Hell; but stand by me and be for me a saviour and a helper. Have mercy, Lord, on my soul, stained with the passions of life, and receive it pure through repentance and confession; for You are blessed to the ages of ages. Amen. Wise Eustratios, divine Auxentios, Eugenios, Mardarios and Orestes, five members of the choir of Martyrs, enlightened the whole world with the torch of their contests. 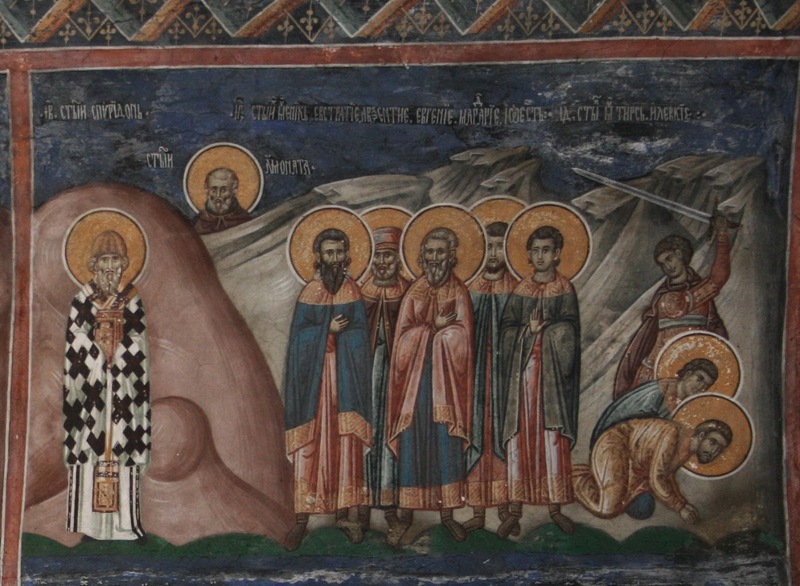 O faithful, in praising them let us cry out: Rejoice, you five holy Martyrs of Christ. Thou shonest as a most brilliant light for them that sat in the darkness of ignorance, O prizewinner. And armed with faith as with a spear, thou wast not frightened by the audacity of thine adversaries, O Eustratios, most eloquent of orators.